For the second time in two years the Milwaukee Brewers have said good-bye to a player who had 20 or more home runs after just one season with the club. With the trade of Adam Lind to Seattle, the Brewers traded his 20 home runs in 2015 to the Mariners for three teenage prospects. Lind spent one year with the team. In 2014 the Brewers signed Mark Reynolds to a free agent contract. 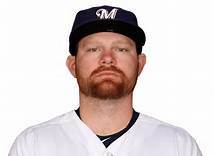 He went on to hit 22 home runs in his only season with the Brewers; he signed a free agent contract with the division-rival Cardinals for 2015. In the Brewers history there have been 11 players who played only one season with the Brewers and had 12 or more home runs in that lone season with the club. Leading the way for the franchise was Don Mincher who hit 25 home runs for the Seattle Pilots (the precursor to the Brewers) in 1969. That off season the Pilots/now Brewers traded Mincher to the Oakland A’s. Here’s a look at the players who played only one season for the franchise yet hit 12 or more home runs in that season. Most home runs in Brewers history with fewer than 100 games played for the team in a career.